Our doctor's office has a drop off box for expired medications, which makes getting rid of them very easy. However, we aren't there very often so I collect any that we have in a large plastic container. 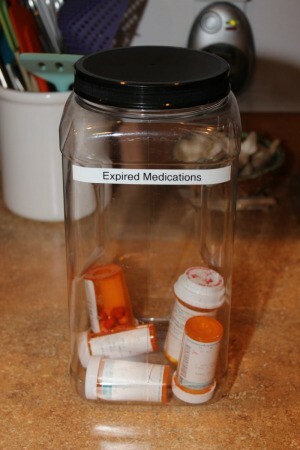 Then whenever I head to the doctor, I bring it with me and drop off the medications. This is interesting. Is it so that the doctors will recycle them so they don't end up in the oceans/landfills? That sounds like a great thing. The quantities of antibiotics and random medicines in the water supply are said to be horrific.